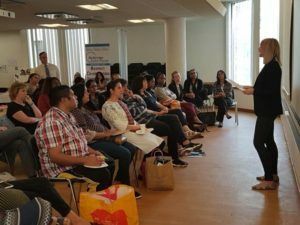 On World Suicide Prevention Day, 10th September, I had the privilege of talking to residents and organisations of Redbridge at a Mental Health Awareness event hosted by Sky Sharma Foundation. It’s fair to say that mental health awareness is on the radar more than ever before, but we still have a long way to go. It is increasingly important to reduce the stigma around mental illness and as such organisations are doing more to ensure it’s employees and employers are learning more about recognising and supporting mental health issues. But how can all of us get better at recognising when others may be experiencing mental health issues? The term ‘Mental Health’ is often used to describe whether we are mentally well or mentally ill. We never really discuss ‘mental health’ when life is good, or positive; but mental health actually describes our cognitive and emotional wellbeing; our state of mind, and because life is full of ups and down, so is our mental health; life events such as unemployment, relationship problems, and bereavement can all impact our mental health negatively. Our state of mind is not fixed, it can change with whatever life throws at us. We are all capable of feeling and experiencing changes in our mental health. And so recognising this in ourselves and others is crucial, and no more so than when we start to hear the language around suicide. Between 2003-2013, 18,220 people with mental health problems took their own life in the UK. Suicide and self-harm are not mental health problems themselves, but they are linked with mental distress. Just last year, Men’s Health magazine revealed that over half of the 15,000 readers surveyed, had had thoughts of suicide, 56% to be exact. Suicide is the single biggest cause of death for men under the age of 50 in England and Wales (Mental Health Foundation) and of all suicides – three quarters are carried out by men. However, it was reported in 2017 that female suicide rates were at their highest in a decade in England. What makes these statistics even more tragic is that those who attempt suicide, or die by suicide, are often deeply conflicted about ending their lives; they do not usually want to die, they just want to stop hurting. Suicide is a desperate attempt to escape suffering that has become unbearable. Recognising the warning signs and taking them seriously. A common myth around suicide is that those who intend to carry it out, won’t talk about it. But we cannot assume this, often those who are thinking suicidal thoughts do not want to die. Be direct and clear – asking shows you care, even if you are incorrect. It can sound something like ‘you know, a lot of people who feel depressed and overwhelmed think about suicide, is this something you have considered?’ Don’t be scared to use the word suicide. We cannot make someone suicidal by showing we care! Be calm and matter of fact. In most cases, people will often say they do not want to take their lives; they just want to escape the pain. But asking these questions will help to elicit whether suicide is, in fact, a serious option or not. Have they thought about it before? Have they ever attempted suicide before? Have they thought about how they might do it? Do they have the means/opportunity? Do you need immediate help, contact your GP, a relative, call for an ambulance etc.? Listen to the person’s story! Aim to find out what’s got them to this point. Take time to listen – often people have not communicated their feelings before and just being able to speak to someone is huge progress. When listening to a story, we’re looking for a ‘turning point’ – something or someone that is that person’s reason to go on. There usually is one. Listening out for hope and talk of the future can be the link we are looking for. There are lots of resources in the community that we can reach to should we need to: CALM (Campaign Against Living Miserably), Project 84, The Samaritans and MIND are just a few. Equally, Suicide Prevention Training with ASIST or Mental Health First Aid training are great ways for us to get better at recognising mental health issues and suicide behaviours, and to feel confident in helping. In many cases, death by suicide is preventable, and a huge part of that is the role we play in getting better at recognising the signs, and being more comfortable with asking the questions. We might be able to help someone, or we might not, but what it certain is that we’ll never know unless we ask! Sky Sharma Foundation is a UK based charity which focuses on ending the stigma and taboo surrounding Mental Health. The Foundation helps to raise awareness by educating and improving the emotional, physical and mental wellbeing of children, teenagers and adults.